Maxillume H60 Bracket Mount Flood Light. If you are looking for a powerful light that will substitute your old yellow halogen lights the brand new Lumitec Maxillume H60 will help you get the job done. Packing more then 6,000 total lumens the new Maxillume model is twice as powerful as previews models. The Maxillume offer more mounting options and a dimmer capability that will allow you to synchronize the light level to a perfect ambiance.The all new Maxillume H60 will put the light where you need it the most, meaning that you will get more usable light and use less power (uses 20% of the power compared to a halogen light). What color light does this fixture offer? Answer: This light comes in a Cool White light. 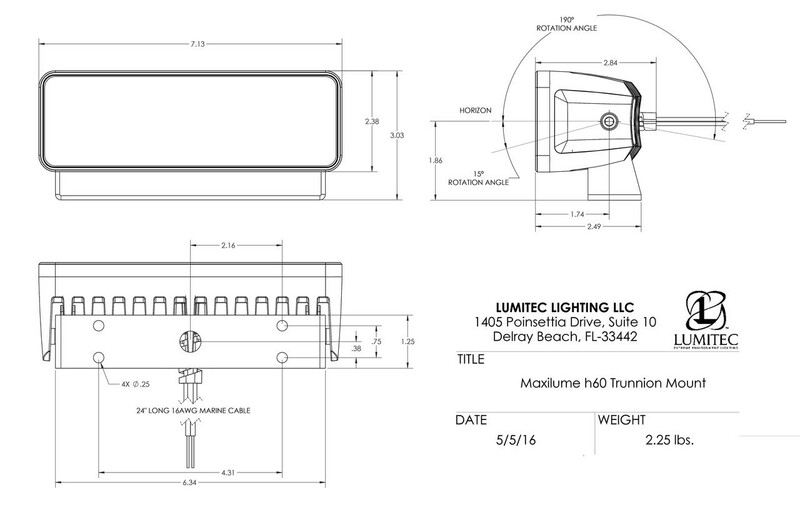 Click the button below to add the Maxillume H60 Bracket Mount Flood Light to your wish list.